A large academic literature in economics analyses changes in household consumption upon retirement. After all, household consumption is the most important part of aggregate demand and the increase in the share of the workforce that will be approaching or past retirement age in the coming years puts this topic at centerstage for both policymakers and researchers. This literature asks whether households plan properly and save enough to have roughly the same level of consumption after as before their retirement. Retirement is arguably among the most predictable and important income changes individuals encounter in their lives, and consumption should not be affected by its onset if households plan properly and save enough. However, a number of empirical studies (e.g. Banks et al. 1998, Bernheim et al. 2001, Haider and Stephens 2007 and Schwerdt 2005) found a sharp decline in consumption during the first years of retirement, a phenomenon referred to as the ‘retirement-consumption puzzle’. It is puzzling to economists why households do not plan properly and save enough for an expected fall in income. But other studies argued that this drop in consumption at retirement is actually not puzzling. Aguiar and Hurst (2005), Aguiar and Hurst (2013) and Hurst (2008) strongly question the claim that there is a decline in actual consumption at retirement. They argue that spending, rather than consumption, decreases on the grounds that individuals reduce their work-related expenses and overall spending through more efficient shopping and household production, as a result of having more free time after retirement. So the mechanism for the drop in spending upon retirement is still debated, as is the broader question of whether individuals save adequately for retirement and plan properly. In a recent paper (Olafsson and Pagel 2018), we revisit the retirement-consumption puzzle and contribute to this debate using new, accurate, and comprehensive data on spending, income, consumer debt, and liquid savings from personal finance management software.1The accurate spending data, covering more than six years, offers a unique opportunity to re-evaluate the puzzle. Moreover, to the best of our knowledge, this paper is the first to document changes in personal finances, that is, liquid savings and consumer debt, around retirement. The data allow us to analyse changes in individual spending, interest payments, and financial account balances upon retirement by comparing the same person before and after retirement. We find evidence of reductions in both work-related and leisure spending categories. However, we note that it is difficult to tell conclusively which expenses are work related, even when we consider very fine categories. After all, one can always come up with a story of how a given consumption category could be work-related. Additionally, we look at personal finances and document that individuals delever around retirement by reducing their consumer debt and increasing their liquid savings. These findings can be seen in Figures 1 and 2 showing the life-cycle profiles of overdraft interest payments and savings interest income. Overdraft interest payments decrease throughout the period when most individuals retire while savings interest increase. Our findings about personal finances (i.e. overdraft interest and savings balances) are very interesting because they are difficult to explain via, for example, work-related expenses. Any properly planning agent who expects a fall in income at retirement will save before retirement and dissave after retirement, rather than the other way around. Unless the reduction in work-related expenses is larger than the fall in income, individuals should always save before retirement and dissave after. If the reduction in work-related expenses is larger than the fall in income, they should retire early. 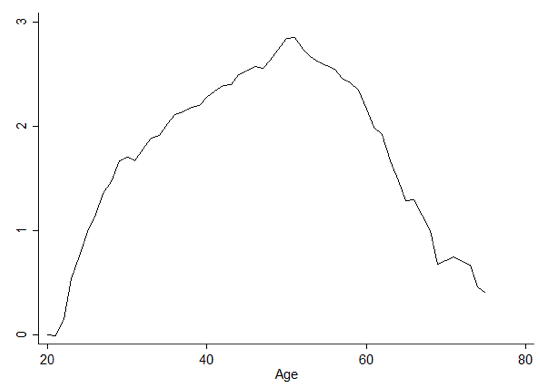 However, the average individual in our sample continues to work voluntarily some time after reaching the age thresholds at which disincentives to retire no longer apply. Thus, our finding that individuals increase their savings after retiring is difficult to explain by work-related expenses or any other theory that reduces consumption needs around retirement. Our findings could be explained by individuals liquidating retirement accounts or other illiquid assets, such as houses, around retirement. To address this concern, we make sure our findings are robust to controlling for income from all sources. Furthermore, we find that investment transactions and all other sources of income are unaffected by retirement status. Overall, we carefully discuss a number of theories consistent with rational planning: work-related expenses, opportunity costs of time, wealth shocks and liquidation of assets, health shocks, and intra-household bargaining. We conclude, however, that they all have difficulty explaining our findings. Reassuringly, we find the same empirical pattern in two commonly used US consumption survey data sets – the Consumer Expenditure Survey and the Survey of Consumer Finances. In the Consumer Expenditure Survey data, we find that retirement results in an increase in savings (measured as income minus spending), checking account balances, and savings account balances. In the Survey of Consumer Finances data, we find that retirement results in reductions in leverage and debt and in increases in checking, savings, and call account balances. Unfortunately, one has to keep in mind that these results suffer from selection bias and measurement error. Beyond these two surveys, we thus replicate our results using individual- and transaction-level bank account data from Germany. Finally, we use two more US survey data sets to replicate our results – the Panel Study of Income Dynamics and the Health and Retirement Study. Because these surveys poll households consecutively, we can also compare the same individuals before and after retirement. In all these data sets, we find that consumption and debt holdings decrease, but savings and checking account balances increase along with other measures of wealth. In turn, we ask which existing models generating a drop in consumption can simultaneously explain our finding that liquid savings increase and consumer debt drops. We argue that the existing models of insufficient planning are not appropriate. However, a model of undersaving before retirement and adjusting consumption patterns afterward, which requires a time-inconsistent overconsumption problem such as hyperbolic discounting (as in Laibson et al. 1998) that is corrected after retirement, is a better candidate. Furthermore, the model in Pagel (2017) of expectations-based loss aversion, as developed by Kőszegi and Rabin (2009), predicts that individuals will correct their overconsumption problem upon retiring. The intuition is the following. When income is uncertain, individuals overconsume in the present and hope for a better realisation of income in the future. But when income is certain, as it is after retirement, overspending results in a sure reduction in future spending, and because individuals dislike such a sure loss, they correct their overconsumption problem after retirement. We thus rationalise a simultaneous decrease in consumption and increase in savings upon retirement in a realistically calibrated life-cycle model. To summarise, we show that even with the finest consumption data, one cannot conclusively tell whether individuals’ actual consumption or just spending drops, and which spending is work-related or not. However, our findings with respect to liquid savings and consumer debt are inconsistent with rational planning, as any rational agent would save more before an expected large fall in income. Thus, work-related expenses cannot fully explain why consumption drops and spending increases, and instead we need a model of overconsumption or insufficient planning. We thus argue that we cannot retire the consumption puzzle just yet. After all, the retirement-consumption puzzle is about individuals not being able to plan for an expected, large, and salient reduction in income, which is unlikely to be the case in light of our new findings about liquid savings and consumer debt. Author's note: We are grateful for the financial financial support of the Pension Research Center (PeRCent) at Copenhagen Business School. We are highly indebted to Meniga's Analytics Team for providing and helping with the data. Aguiar, M and E Hurst (2005), “Consumption versus expenditure”, Journal of Political Economy 113(5): 919-948. Aguiar, M and E Hurst (2013), “Deconstructing life cycle expenditure”, Journal of Political Economy 121(3): 437-492. Banks, J, R Blundell and S Tanner (1998), “Is there a retirement-savings puzzle?”, American Economic Review 88(4): 769-788. Bernheim, B D, J Skinner and S Weinberg (2001), “What accounts for the variation in retirement wealth among US households?”, American Economic Review 91(4): 832-857. Haider, S J and M Stephens (2007), “Is there a retirement-consumption puzzle? 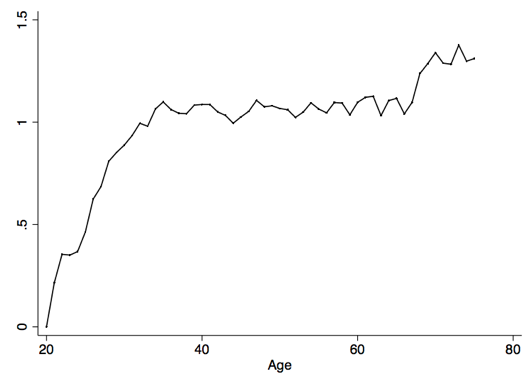 Evidence using subjective retirement expectations”, Review of Economics and Statistics 89(2): 247-264. Hurst, E (2008), “Understanding consumption in retirement: Recent developments”, in Ameriks, J and O Mitchell (eds), Recalibrating retirement spending and saving, Oxford University Press. Kőszegi, B and M Rabin (2009), “Reference-dependent consumption plans”, American Economic Review 99(3): 909-36. Laibson, D, A Repetto and J Tobacman (1998), “Self-control and saving for retirement”, Brookings Papers on Economic Activity 1: 91-196. Olafsson, A and M Pagel (forthcoming), “The liquid hand-to-mouth: Evidence from a personal finance management software”, Review of Financial Studies. Pagel, M (2017), “Expectations-based reference-dependent life-cycle consumption”, Review of Economic Studies 84(2): 885-934. Schwerdt, G (2005), “Why does consumption fall at retirement? Evidence from Germany”, Economics Letters 89(3): 300-305. This dataset has already proven useful for studying, among other things, the spending responses of individuals to income arrivals (Olafsson and Pagel forthcoming) and the drivers of individuals’ attention to their personal finances (Olafsson and Pagel 2017).